Most of the eight large “Powerhouse” providers of ICT solutions are losing share of voice in analysts’ research. 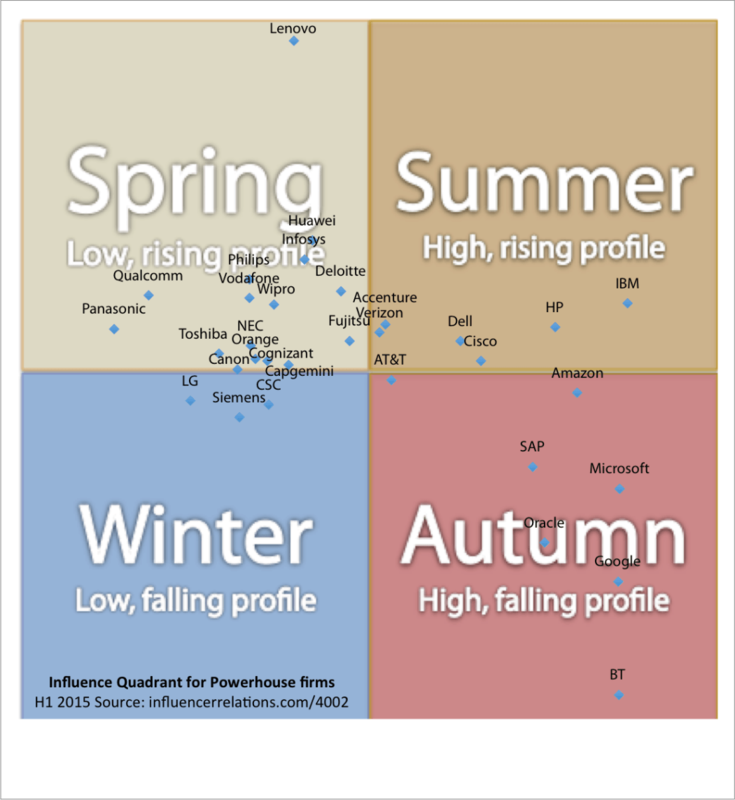 That’s the finding, which we previewed last week, of the H1 2015 Influence Quadrant for Powerhouse firms. It’s shown below, and you can click here to read about the Influence Quadrant method. As we’ve said before, many Powerhouse vendors are struggling to capture analysts’ imagination right now. BT, Google, and Oracle stand out as firms with overstretched AR resources, and an unusually large fall in profile in research over the last six months. Even senior analysts following these companies report dramatically different experiences of the same time: some find them knowledgeable, responsive and friendly; other analysts call them uncooperative, secretive, controlling or inconsistent in their communications. It’s unusual to see such broad falls in analyst research. According to what analysts are telling the Analyst Attitude Survey, it’s increasingly the case that analysts feel that some firms are dropping the ball on consistent analyst relations. These are huge companies, with some of the best AR leaders available. Comments by delighted analysts show that these firms know how to do AR well. BT: “friendly with solid professionalism”; “Great team. Very responsive”; “well engaged”. Google: “great relationship and they are very good”; “Excellent access to key execs”; “They are much more open, which is fantastic”. Oracle: “Excellent group of knowledgeable people”; “quite helpful in the research I do”; “Very talented group, knows coverage areas extremely well, very pro-active and engaged”. Despite these comments from a minority of delighted analysts, most other analysts don’t feel the love from these firms in the same way. As a result, their profile is falling. Indeed analyst relations managers in every business are tempted to focus on the top analysts firms, like Gartner, IDC, and Forrester. However, many of these powerhouse firms are falling even in the research of those influential companies. Not only is the volume of communication inconsistent between these companies, but so is their candor. Over time, the ability of enterprises to be candid with analysts is a reliable predictor of whether analysts will recommend these firms. Analysts tell us that Google and Oracle are among the least open firms. That lack of candor narrow the bottleneck even further and means that many analysts struggle to outline confidently the value those companies that deliver. The Influence Quadrant is just one way of looking at the outcomes of analyst relations programs. It looks only at how often firms are mentioned in analyst research. Because of the enormous volume of research reports, however, the Influence Quadrant produces a picture that is objective, replicable and easily understood at a glance. But the Influence Quadrant tells us what is happening, and not why. We track hundreds of firms, and they can’t fit comfortably into one chart. In the Influence Quadrant for Powerhouse firms, we’ve picked firms which are followed by a lot of analysts and which have solutions that span the five different market segments we use (cloud, services, software, systems, and telecoms). The decision about which firms qualify as ‘Powerhouse’ is qualitative, and we’d welcome feedback about which firms might be added to, or removed from, this chart. In particular, Lenovo and Panasonic could easily fall out while we gave strong consideration to adding Apple and Salesforce to the Powerhouse group. What is certain, however, is that the Analyst Attitude Survey tells us why the AR programs of these firms are frustrating analysts. In the H1 study, which just closed, Almost 400 analysts gave us their opinions about the companies they research. With many of the most written-about Powerhouse firms, analysts are not only writing about them less than they did: they are also less likely to recommend them than the average competitor. Some Powerhouse firms might be assumed to have high, almost oligarchical, market positions that mean that analysts will recommend them confidently even if they are not candid. That seems not to be the case. Indeed, an early analysis of the data shows that that the 50% of Powerhouse vendors followed by the most analysts are not more positively recommended than the 50% followed by the fewest analysts. There are many possible explanations for falling share of voice in analyst research. We know that higher volumes of mentions in analyst research are positively correlated with more sales recommendations. The Influence Quadrant shows that some firms are falling fast on that measure. Putting those two together, we develop the hypothesis that these companies are losing sales because of their small communication volume and little candor with many analysts. The Analyst Attitude Survey strongly confirms it: Powerhouse firms are losing their competitive advantage in winning better recommendations from analysts. The good news is that this is easy to fix. Every firm has shows that it knows about to build strong relationships with its preferred analysts. However, these preferred analysts are not the only ones writing about Powerhouse companies and their competitors, even at the top analyst houses. That said, while it is easy to fix, the will to change is pretty limited in these firms. Oracle’s approach to analysts certainly waxes and wanes, but it has been consistent for decades. It’s very unlikely that it will, for example, try to emulate Accenture. That opens up a competitive advantage. If you work at SAP or Atos, just to pick some names out of the air, it might not occur to you that your firm is exceptionally candid with analysts unless you see that in the Analyst Attitude Survey. That might be a bigger competitive advantage for you than, say, your vision and execution. If you play to that, then analysts will start to pick up that candor is a catalyst for vision and execution. What does this mean for industry analysts? First, let’s say that the message is getting across. Firms that are using the Analyst Attitude Survey or similar tools generally improve year after year. Your feedback is evidence that AR teams are using successfully to get more resources and more commitment to half the analyst community. Similarly, you have no choice other than to write more about firms that are more open and write less about the ones that are secretive. To find more about the Analyst Attitude Survey and the Influence Quadrant, contact us.